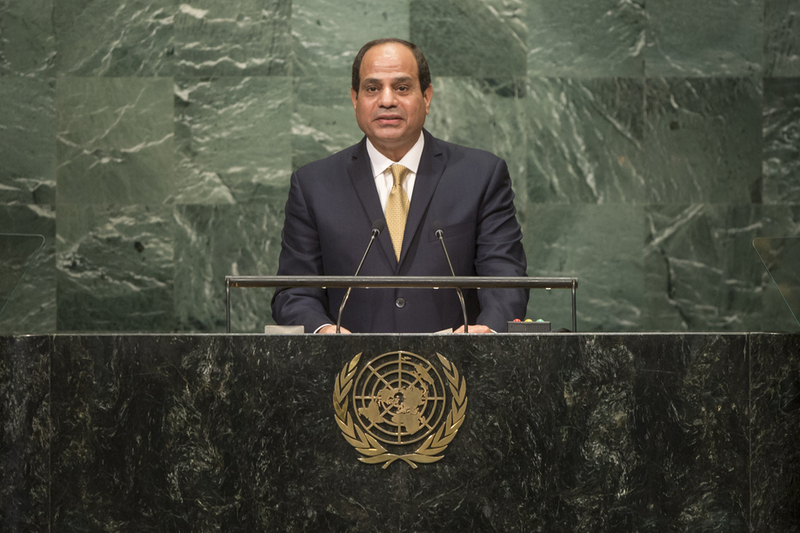 ABDEL FATTAH AL SISI, President of Egypt, said that despite the adoption of the 2030 Agenda and the Addis Ababa Action Plan, developing countries were not afforded a sufficient opportunity to achieve sustainable development. The role of the State must be supported in order to guarantee a balance between the different dimensions of sustainable development. He affirmed Africa’s commitment to confronting the challenge of climate change and its aspiration towards implementing technology transfer and sustainable financing. Egypt had established the track for the African Renewable Energy Initiative and presented it in the context of its presidency of the committee of African leaders concerned with climate change. Egypt’s new constitution enshrined rights and freedoms based on the Universal Declaration of Human Rights, consolidated protection for vulnerable groups and paved the way for women to occupy an unprecedented number of the seats in the House of Representatives, he said. Highlighting the deterioration in regional security, he said that Egypt had managed to preserve its stability in the midst of a highly unstable region, thanks to the solidity of its institutions and its people’s awareness of their great cultural heritage. Egypt was “an anchor of stability in the Middle East”. He noted several regional conflicts. The continued violence in Syria was no longer acceptable and a halt to hostilities was a necessary step that would lead to a political settlement. On the Arab-Israeli conflict, the hand of peace remained extended through the Arab Peace Initiative, he said, and appealed to the Israeli people to look for a solution. “We have an opportunity to move towards peace,” he said. The Egyptian experience could be repeated by establishing a Palestinian State side by side with the Israeli State. In Libya, the implementation of the Sukhirat agreement faced continued difficulties, which had direct implications for Egyptian security. He called for the lifting of the arms embargo imposed on the Libyan army. Egypt supported the efforts of United Nations envoy Ismail Ould Cheikh Ahmed to resolve the crisis in Yemen. “I must reiterate Egypt’s rejection of any foreign interference in Arab affairs,” he said. Turning to issues of the African continent, Egypt favoured enhanced cooperation between the African Union and the United Nations and supported efforts to operationalize the African Standby Force, he said. He stressed the importance of supporting the Somali Government and the need for resolution of the political crises in Burundi and South Sudan. Terrorism was an urgent threat to international peace and security and it was necessary to address the roots of the phenomenon and decisively confront terrorist groups. Unconventional threats to international peace and security had left the world at a crossroads, and it was essential to instil the principles of tolerance and coexistence in the minds of people.